Microsoft’s Edge browser may be struggling to find devoted fans, but its developers are making every effort to bring it up to par, especially with extensions. 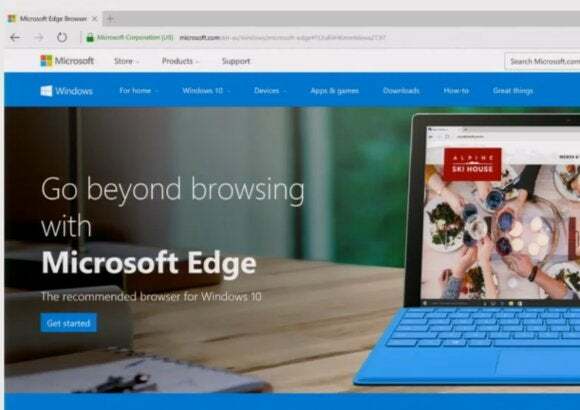 Over the course of a one-day Edge developer summit on Monday, Microsoft showed off how Edge could increase its number of compatible browser extensions by simply changing a line or two of code in an extension written for Google Chrome. And the company pledged to keep its security tight through an upcoming change to “sandbox” Adobe Flash, a popular vector for browser attacks. Morris laid out Edge’s priorities throughout 2016. 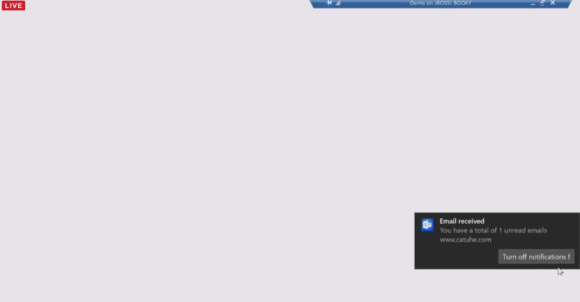 According to Edge’s principal program manager Charles Morris, the point of designing Microsoft Edge was twofold: To break away from the past 20 years of legacy code that Microsoft had built into Internet Explorer, and to set the “foundation for the next 20 years of the web.” For backwards compatibility of legacy enterprise apps, Microsoft ships both IE and Edge as part of Windows 10. Morris said that 150.8 million users use Edge monthly, with the amount of Internet traffic from Edge doubling over the past month. 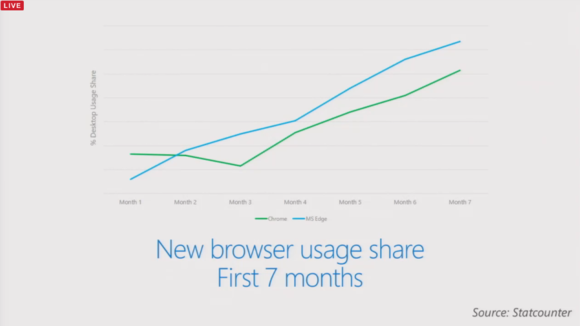 Microsoft believes, based on data collected from the tracking tool StatCounter, that its browser share has outpaced Chrome for the first seven months of its life. Of course, that waves away the fact that millions of users automatically added Edge as part of Windows 10, and the fact that users are abandoning IE/Edge for other browsers in droves. Microsoft claims that the pace of adoption puts Edge ahead of Chrome. Why this matters: With the relative ease that users can import bookmarks from one browser to another (though arranging them can sometimes be a pain), users can switch from one browser to the next with relative ease. Our tests indicated that the base installation of Chrome (with extensions switched off) consumes quite a bit of memory—but Edge was worse, as it’s both bloated and slow. The point, though, is that the race is never over, and Edge can still catch up. But without user-facing features like extensions, they won’t bother. Extensions for Edge, however, are already here, at least in the Insider beta software that Microsoft has distributed. There are about eight, including AdBlock and AdBlock Plus, which will block ads inside Edge, rather than the browser itself. Right now, the extensions have to be sideloaded, but soon they’ll be in the Windows Store. 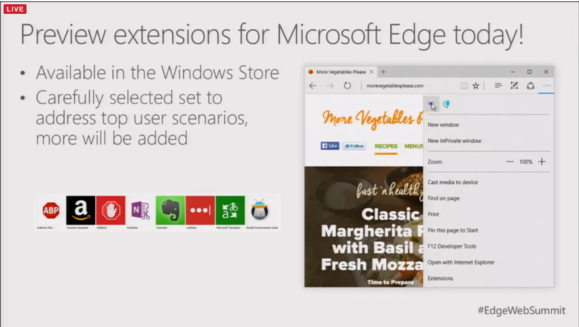 Microsoft’s Edge extensions, which are really just available to Windows Insiders. 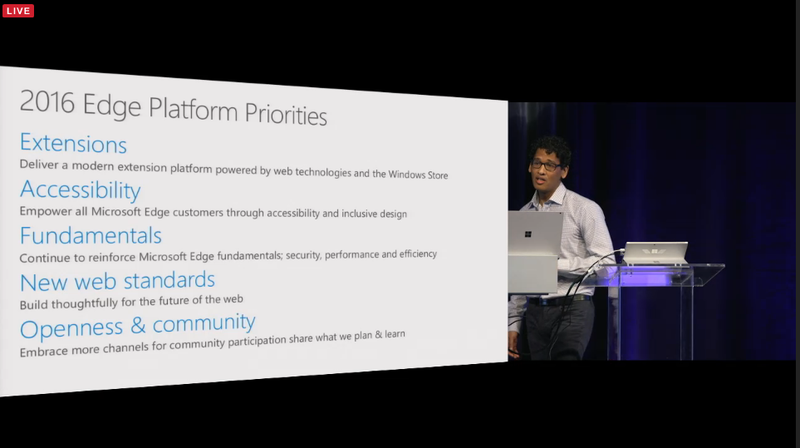 Rory Fairweather, a program manager at Microsoft responsible for Microsoft Edge’s extensions, said that extensions have been the most requested feature for Edge. No wonder, as they’ve been in other browsers for years. What’s interesting, though, is that developers will apparently be able to easily port extensions from Chome, either through a tool that Microsoft will provide or, as Fairweather did, by changing a line or two of code. “We’re creating a porting tool for extensions on another browser, with minimal changes, and we’ll be sharing more information on that very soon,” Fairweather said. As an example, Fairweather took a OneNote Clipper extension developed for Chrome, and ported it to Edge. Developers will be able to call standardized APIs that other browsers use, but also APIs that will be specific to Edge, including changing basic icons, messaging between components, networking, and more. Much of the Edge developer conference recapped what Microsoft has said before, including that communication protocols like WebRTC are coming soon to allow real-time communication in the browser. Microsoft also has several “prototype investigations” underway into Web payments, ServiceWorker offline apps, and more. ServiceWorker also helps in-browser push notifications, a feature the Edge team is investigating but that Google’s Chrome developers apparently have given up on. Here’s an early look at an in-browser Edge notification. Security has been one of the driving forces of Edge. The browser was built from the ground up with security in mind, specifically isolating and sandboxing processes to minimize any possible damage using what Microsoft calls AppContainers. Within an AppContainer, the code is prevented from reading or writing to the system as well as any higher-priority processes, according to David Weston, a senior security tester for Microsoft. Weston said that in an upcoming version of Edge, Flash processes will be effectively isolated in their own AppContainers. Rob Trace, a senior program manager at Microsoft, also revealed why biometric support has been slow to roll out across Edge and its interaction with Web sites. Microsoft’s Edge uses an “early implementation” of the FIDO specification, which isn’t totally compatible with the finished version. Over time, it will be, allowing users to tap into Windows Hello to log in with their face or fingerprint and validate themselves over the Web, he said. “It’s great for prototyping, it’s great for determining how the final model will work,” Trace said of the current FIDO implementation within Edge.